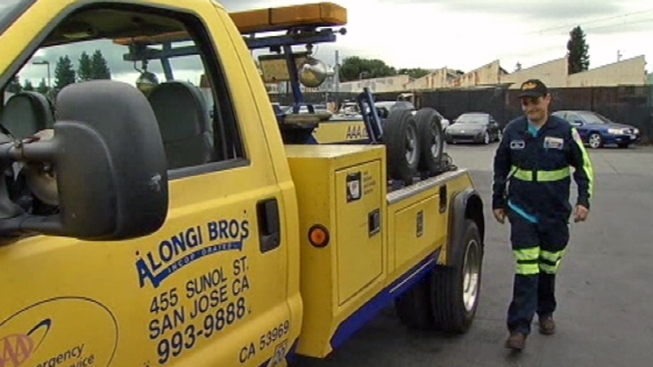 Ian Knapp drives a tow truck all over the Bay Area, sometimes working as many as 65 hours a week, helping people who are stranded in unsafe situations. It wasn’t long ago, Knapp needed help himself. “I became a foster child while I was in elementary school and spent the majority of my young years there,” Knapp said. He confided that his parents were abusive and even though he eventually was allowed to return to their home, he left soon after. “I did not graduate from high school. I actually had dropped out halfway through my senior year and became homeless, and I’ve been homeless up until I got this job,” Knapp said. He got the job with Alongi Bros. through TeenForce, a Silicon Valley non-profit staffing agency which serves job seekers between the ages of 14 and 20 years old. Sixty-percent of their clients are former or current foster youth. TeenForce screens the job seekers, helps them with resumes, interviewing skills, and any necessary background checks or licensing. They’ll even handle payroll for the 60 employers that work with the agency. For some of the teens, the temporary job has turned into permanent long-term employment. One teen is now a state-licensed termite inspector with Planet Orange, and several others are working in the mortgage industry. “Nobody needs to be a self-sufficient young adult faster than these young people and we want to prove that Santa Clara County, through private sector business, without any government funding and we want to prove that we can do that here and be a model for other counties,” said John Hogan, TeenForce founder and CEO. This year, TeenForce set a goal of putting 100 foster youth to work in one year. Through a partnership with the Silicon Valley Chamber of Commerce, the agency is on course to hit that goal ahead of time. Now what they’d like are more employers to take a gamble on kids who ended up in foster care, not because they were bad, but because their situation was. In its three years, TeenForce put 275 people to work, earning nearly $700,000. And they’ve helped create relationships that work for the teens and managers like John Golden of Alongi Bros.
“It makes me feel good that I helped Ian out. He’s a nice person, and it’s nice to have a nice person working for you,” Golden said.